This tutorial shows you, as a builder, how to customize the operator's view of your application. 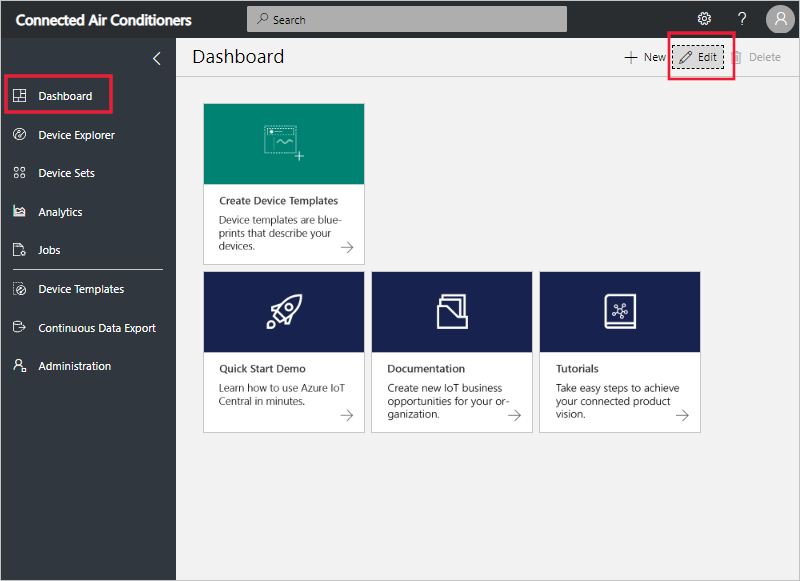 When you make a change to the application as a builder, you can preview the operator's view in the Microsoft Azure IoT Central application. 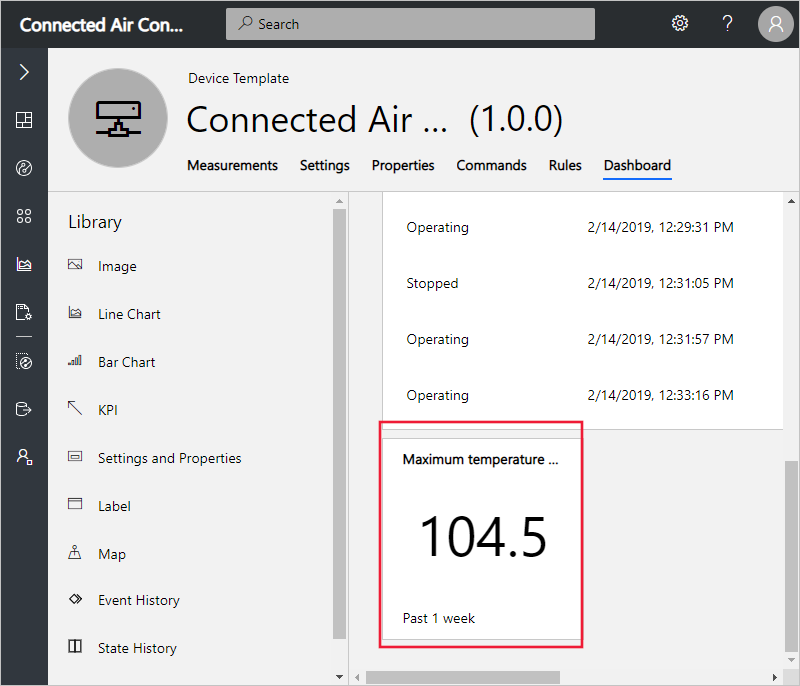 In this tutorial, you customize the application to display relevant information about the connected air conditioner device to an operator. 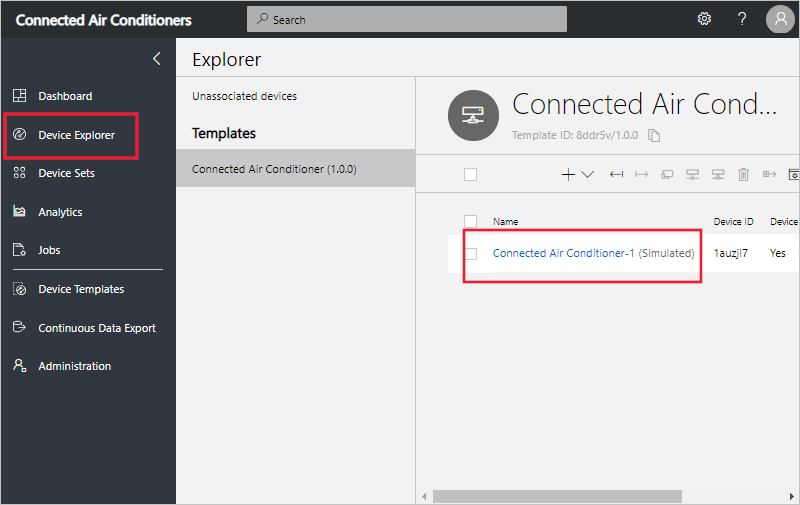 Your customizations enable the operator to manage the air conditioner devices connected to the application. 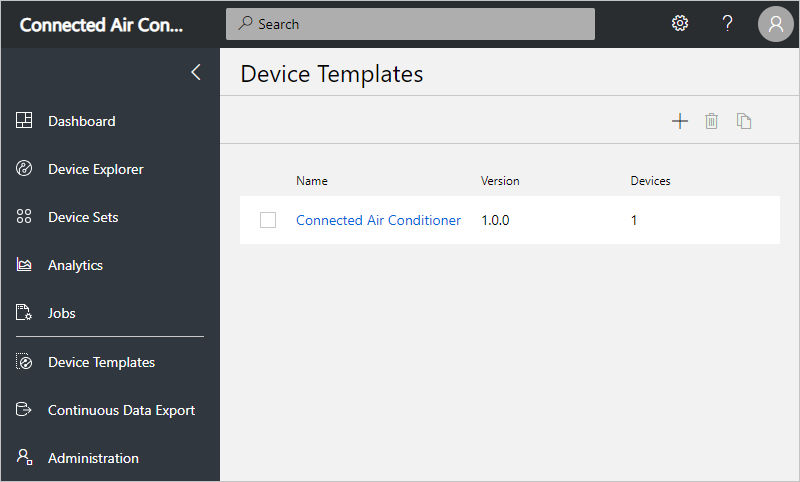 Define a new device type in your Azure IoT Central application. Configure rules and actions for your device. As a builder, you can define what information displays on a device dashboard. 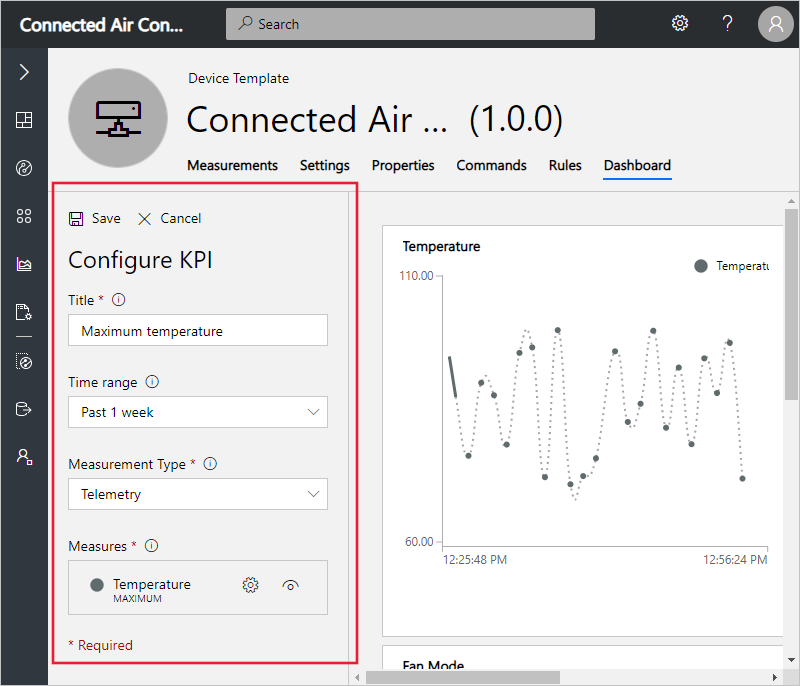 In the Define a new device type in your application tutorial, you added a line-chart and other information to the Connected Air Conditioner dashboard. 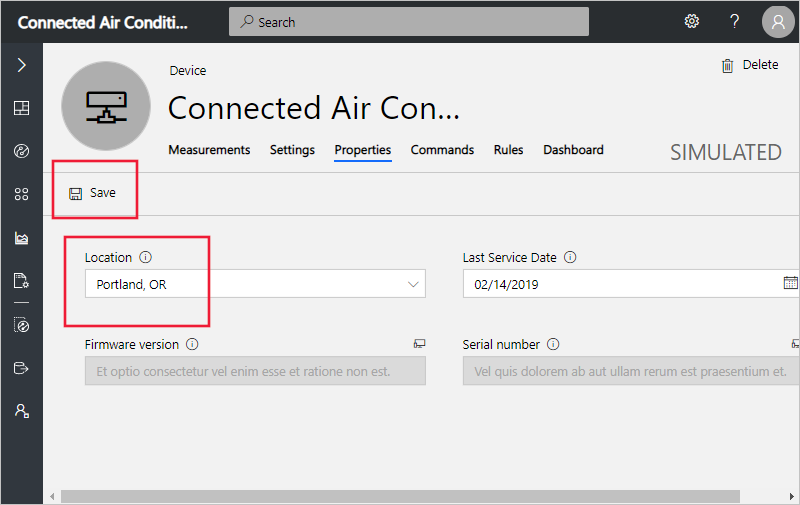 To customize your device dashboard, select the Connected Air Conditioner (1.0.0) device template device you created in the Define a new device type in your application tutorial. To edit the dashboard, select the Dashboard tab. To move or resize a tile on the dashboard, move the mouse pointer over the tile. You can drag the tile to a new location or resize it. As a builder, you can also configure the operator's view of the device settings. An operator uses the device settings tab to configure a device. For example, an operator uses the settings tab to set the target temperature for the connected air conditioner. To edit the settings layout for your connected air conditioner, choose the Settings tab. 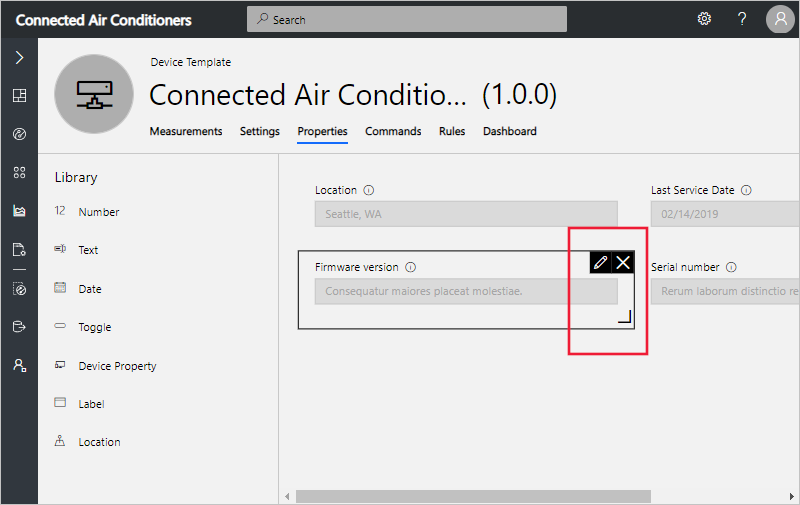 In addition to the dashboard and settings, you can also configure the operator's view of the device properties. An operator uses the device properties tab to manage device metadata. For example, an operator uses the properties tab to view a device serial number or update contact details for the manufacturer. 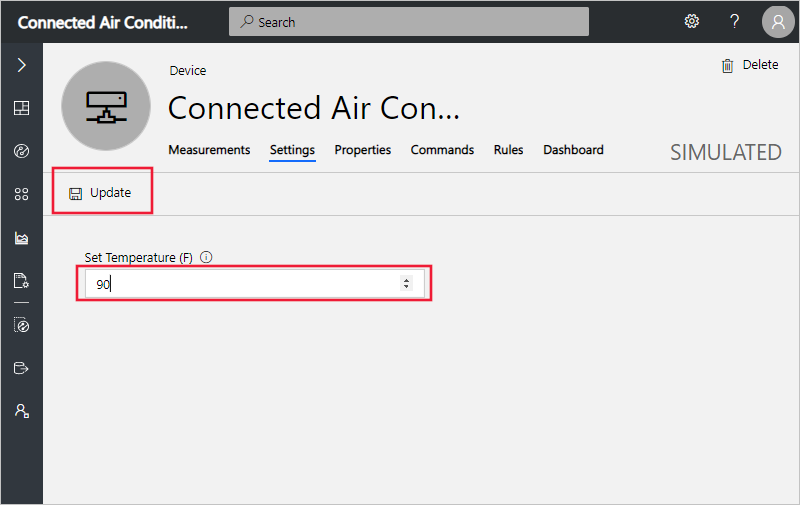 To edit the properties layout for your connected air conditioner, choose the Properties tab. 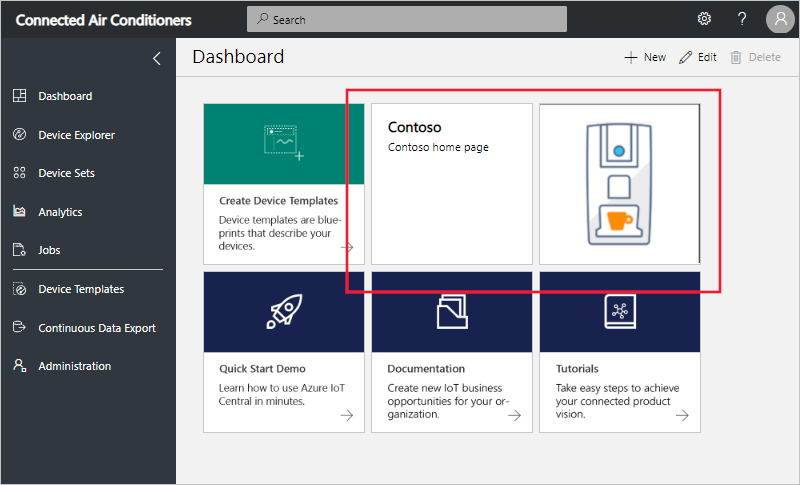 You use the Device Templates page to customize the dashboard, settings, and properties tabs for an operator. 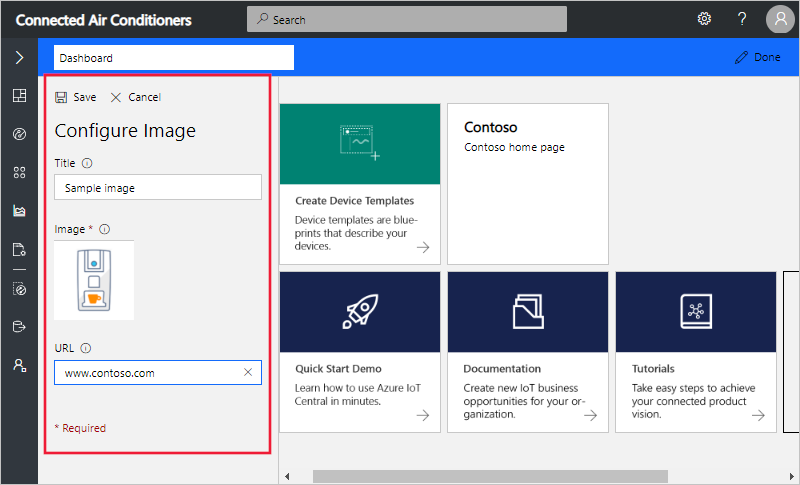 You use the Device Explorer page to view and use the device template. When the device acknowledges the new setting value, the setting shows as synced on the tile. 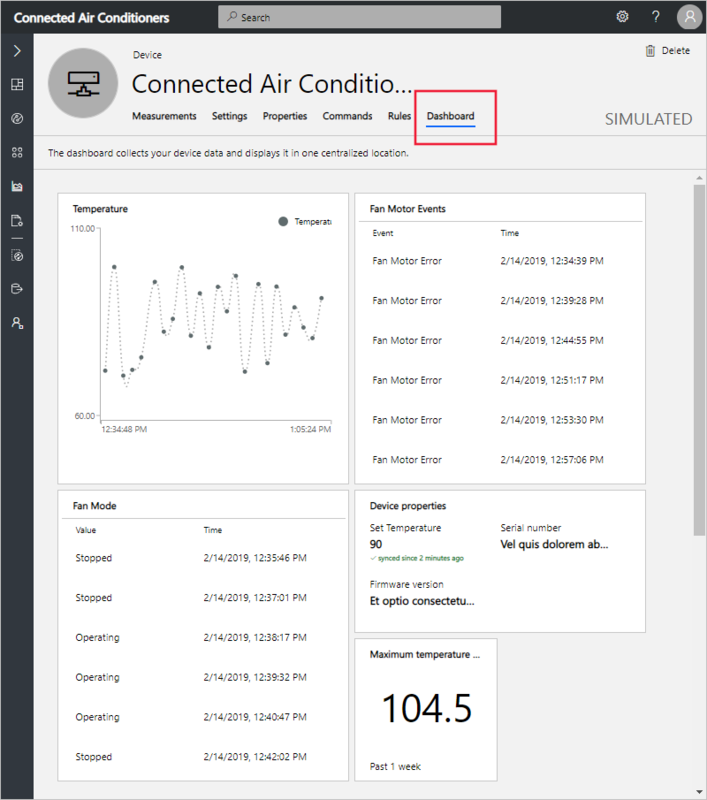 When a builder or operator signs in to an Azure IoT Central application, they see the application dashboard. As a builder, you can configure the content of the default dashboard to include the most useful and relevant content for an operator. Users can also create their own personal dashboards and choose one as their default. To customize the default application dashboard, navigate to the Dashboard page and select Edit on the top right of the page. A panel appears with a library of objects you can add to the dashboard. 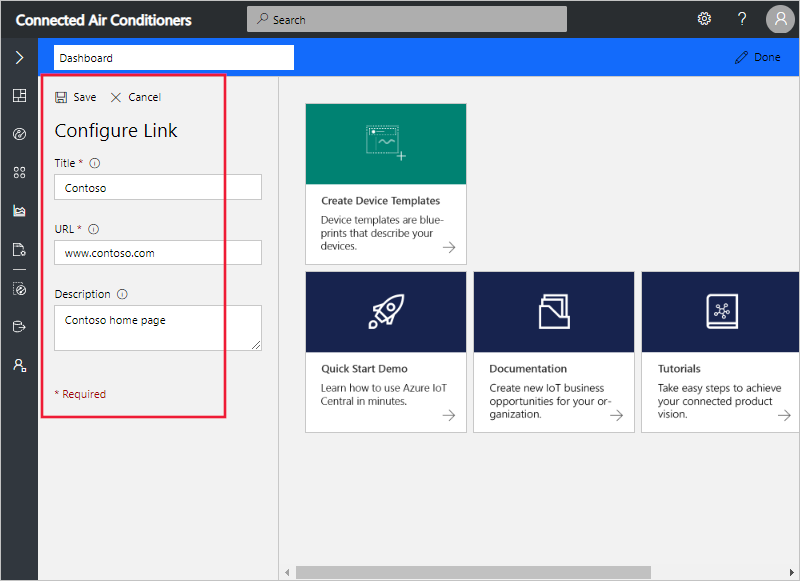 You can also add links to pages within your Azure IoT Central application. For example, you could add a link to a device dashboard or settings page. 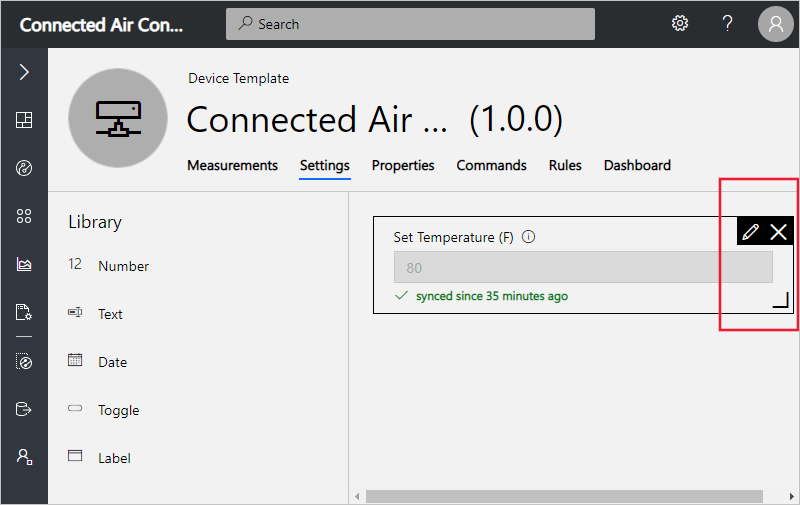 To learn more, see How to prepare and upload images to your Azure IoT Central application. To preview the application dashboard as an operator, select Done on the top right of the page. You can select the link and image tiles to navigate to the URLs you set as a builder. In this tutorial, you learned how to customize the operator's view of the application.